Network request test subject represent a single network request made during the test execution. 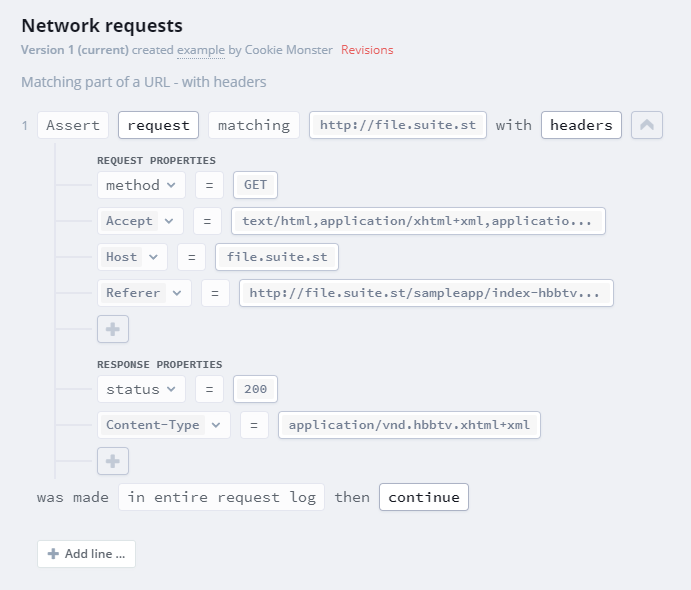 Assertions involving the network request subject will only work with requests that go through Suitestify. Instead of looking for an exact URL, you can look for a substring. This is especially useful if the URL you are looking for contains dynamic parameters. Sometimes the app may load the same or similar URL multiple times. You can instruct Suitest to ignore the requests that have previously had a match. You can add HTTP headers to the assertion. Both request and response headers are supported. HTTP headers containing random or changing information are most of the time not suited for assertions. Suitest starts a fresh network log at every test execution initiation. The log is empty at the beginning and fills up as the application progresses through the test. All assertions involving the network request subject are made against that log. When running the test line-by-line every next execution is considered a separate test run and the network log is cleared. Therefore if you run only the line with a network request assertion it will most definitely fail. You should run the network assertion line together with other parts of the test that will ensure that the network log is properly filled.